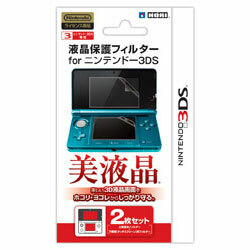 «©NCSX» The Nintendo 3DS shipped in February and like previous Nintendo handhelds that have been released over the past two decades, the screen will need protecting. Not only from dust, pollen, and Cheetos but also grime, greasy fingerprints, and anything else that's out in the wild. To help gamers prevent screen pollution and/or unsightly smearing, Hori enters the scene with the aptly named Screen Protect Filter for the DS. The package includes two filters which are perfectly sized to protect the top and bottom screens. The application process of the filter atop each screen isn't difficult but does require a slow and easy technique to avoid misalignment. This document is ©NCSX 2011. All rights reserved. No reproduction in whole or in part of this document may be made without express written consent of National Console Support, Inc.